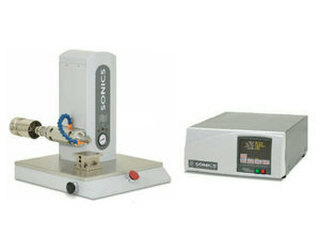 MW series ultrasonic metal welders offer superior performance, versatility and lower operating costs. - Patented self-orienting horn and tips permit simple, quick and precise tool change in under one minute. - Patented one-piece horn/booster with dual nodal mounts assures the optimum efficiency of sonic transmission and eliminates horn deflection. - Weld quality monitoring is available in time, energy and distance. - Micrometer adjustment of the anvil height simplifies anvil set up, anvil reconditioning and weld quality. - Exclusive Sonics’ safety system advances the slide at low force until it is within 1 mm of closure to protect the operator, even with foot pedal operation. - Heavy duty cylinder and mechanical linkage provides up to 3000 newton force for 20 kHz.